Ukraine plans to boost defense and technical cooperation with the United Kingdom (UK). One of the key directions of the partnership on the new conditions will be cooperation in the imports replacement. The press service of Ukroboronprom State Concern has reported that the opportunities for expanding defense cooperation were discussed by the sides during a visit of UK Defence Secretary Michael Fallon to Antonov State Enterprise (Kyiv) on January 20. Fallon studied the promising projects of Ukrainian aviation industry, including new transport aircraft An-132 being designed by Ukraine under the order of Saudi Arabia with participation of Britain's Dowty Propellers and Ipeco. Fallon positively assessed experience of bilateral cooperation under the An-132 program. He said that UK intends to deepen defense cooperation with Ukraine in the future. Antonov President Oleksandr Kotsiuba recalled about successful experience of Ukrainian-UK cooperation on the global heavy air transportation market and in the area of strategic air transportation using Ukrainian heavy transport aircraft An-124-100 Ruslan and An-225 Mriya. He said that starting January 2017 the representative office of Antonov Airlines – Dreamlifts Ltd. – is working in London suburbs. Antonov state enterprise is the leading Ukrainian developer and manufacturer of aircraft, the recognized world's leader in the niche of transport aircraft for wide purposes. The company cooperates with 76 countries. 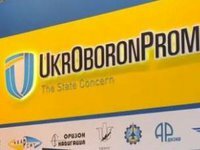 According to the government decision, Antonov has been part of Ukroboronprom state concern since April 2015.